Rising out of the sea in the Baie de Saint-Michel on the coast of Normandy, the island of Mont Saint-Michel and its magnificent abbey are among France's most striking sights. The Abbey of Saint-Michel, a UNESCO World Heritage Site, perches on the highest point of the rocky islet. Looking like a fortified castle surrounded by ancient walls and bastions, it is one of the most awe-inspiring Gothic churches ever built. At high tide, Mont Saint-Michel appears from afar as a mystical island with its Gothic spires soaring 155 meters above the sea; at low tide, it is possible to walk around the island. Legend has it that Archbishop Aubert of Avranches founded an abbey here in 708 after the Archangel Michael appeared to him in a vision, making this an important place of pilgrimage. Medieval pilgrims arrived by foot, crossing the Bay of Mont-Michel at low tide, sometimes challenged by unexpected riptides and quicksands. Although getting to this remote setting from Paris may not present the dangers it did to medieval pilgrims, it can still be a challenge. It takes about 3.5 hours to drive there and about an hour longer by train to Rennes and then by bus. With so many things to do here, you'll want to spend at least four hours to tour the abbey's cloister, refectory, and ramparts; have lunch; and see the extreme tides shift the landscape between water and sand. This makes a long day for a driver. A more convenient way is to join a full-day tour to Mont Saint-Michel from Paris that includes direct transportation by bus or van. Or you can stay overnight either in the village below the abbey or in nearby hotels on the mainland. Known as "La Merveille" ("The Marvel"), the Abbey of Mont Saint-Michel is truly a marvel of medieval architecture. Since the Middle Ages, this ultimate pilgrimage site has also been called "The Heavenly Jerusalem" and "Pyramid of the Seas." Soaring to a height of 155 meters above the sea, the abbey is an amazing feat of construction. It is even more miraculous considering the difficulties of bringing building materials across the Bay of Saint-Michel; many perished while attempting to cross the bay's sandy shores during unforeseen riptides. In spite of great technical challenges, the abbey was built between the 11th and 13th centuries in exquisite Gothic style. To arrive at the abbey, visitors and pilgrims must begin at the old gates, walk through the village and ascend 200 meters. Then there are 350 steps up the "Grande Degré" (Grande Staircase) to reach the entrance of the abbey. The lowest floor has peaceful gardens and a spacious hall called the "Aumônerie," which was a dormitory for pilgrims in the 13th century. On the middle floor is the vaulted "Salle des Chevaliers" (Knights' Hall), where noble knights were received, and the "Crypte des Gros Piliers" (Crypt of Large Pilars). The most magnificent area of the abbey is on the second floor: the Cloisters, Refectory, and the Abbey Church. Exemplifying serene monastic architecture, the cloisters feature 220 graceful granite columns in double alternating rows. The splendid Eglise Saint-Michel (Abbey Church), begun in 1020, has a majestic Romanesque nave and an ornate 15th-century Gothic choir. The sanctuary astonishes visitors with its breathtaking beauty and inspiring spiritual ambience. From the Abbey Church, the "Escalier de Dentelle," (staircase) leads up to a terrace with spectacular views overlooking the sea. The island of Mont Saint-Michel takes visitors on a spiritual journey into the world of the Middle Ages. The entire island is a pedestrian zone, and most of the stone buildings date from the 13th-16th centuries. Typical of the medieval era, the island is surrounded by ancient walls (ramparts) that protected against invasions. Tourists can take a walk around the "Chemin des Remparts" (Ramparts Pathway) to enjoy the scenic views. To arrive at the ramparts, a 1.8-kilometer walk leads along a causeway from the mainland to the foot of the rock (where the parking lot is located). Beware, sometimes high tide reaches the parking lot. From there, continue through the outer walls at the Porte du Roi. The immense stone ramparts circle the edge of the island and feature battlements that were used to fight off invaders. From many points along the Chemin des Remparts," there are sweeping panoramas of the Bay of Saint-Michel. The island's only street that runs parallel to the ramparts, this cobblestone pathway takes visitors through the medieval village of Mont Saint-Michel. Tourists enter the island of Mont Saint-Michel at the old Burgher's Guardroom, which now houses the Tourist Office, and then walk through the Boulevard Gate and then the King's Gate to arrive at the Grand Rue. This charming street is lined by tightly-packed stone houses of the 15th and 16th centuries, which now are occupied by souvenir shops, snack bars, cafés, restaurants, and hotels, including the famous Auberge Mère Poulard. Tourists will stroll past the 15th-century parish church dedicated to Saint-Pierre. Other noteworthy attractions along the Grand Rue include the Archéoscope (an entertaining multimedia show that describes the construction and history of Mont Saint-Michel Abbey) and the History Museum with a collection of old weapons, paintings, and sculptures that gives insight into the historic prisons and monks' lives of Mont Saint-Michel. Also worth visiting is the Logis Tiphaine (Tiphaine's House) built in 1365 by the Knight Bertrand du Guesclin (constable of the King of France's armies) for his wife Tiphaine. Now a museum open to the public, this historic house has wonderful period furniture and other medieval artifacts. The Grand Rue ends at the Grand Degré, a flight of steps leading up to the entrance of the Saint-Michel Abbey. At the end of July, there is a pilgrimage across the Bay of Saint-Michel. However the pilgrimage depends on the tides. Those interested in taking this pilgrimage should check with the tourist office before planning a trip. There is also an important pilgrimage, known as the Autumn Pilgrimage, at the end of September on Saint Michael's Day. The pilgrimage celebrates the Archangel Michael and several religious events. On the nearest Sunday to Saint Michael's Day, a solemn mass is held in the Abbey Church. Later that day, there are vespers and an evening mass at the Parish Church. On September 29th (Saint Michael's Day), the Abbey Church and Parish Church hold morning prayers and mass. This auberge is a legendary institution on Mont Saint-Michel, begun in 1888 by Annette and Victor Poulard. Annette was only twenty at the time, but she was a good cook and became fondly known as La Mère Poulard (Mom Poulard). The inn welcomed pilgrims as well as visitors who came to sample La Mère Poulard's famous cooking. Today, the Auberge Mère Poulard includes the hotel, a restaurant, and a more casual café. Both the restaurant and café serve La Mère Poulard's culinary specialty: the omelette. La Mère Poulard was also well known for "biscuits" (butter cookies made with the finest Normandy butter), still produced and sold at the Mère Poulard boutique on the Grand Rue. Hotel Gabriel: 3-star hotel, near restaurants and a free shuttle, quirky decor, family rooms. Hotel Mercure Mont Saint Michel: mid-range pricing, modern decor, clean rooms, comfortable beds. La Jacotiere: affordable B&B, bucolic setting, immaculate rooms, French breakfast with croissants. Les Vieilles Digues: budget-friendly B&B, wonderful host, lovely garden, excellent breakfast. 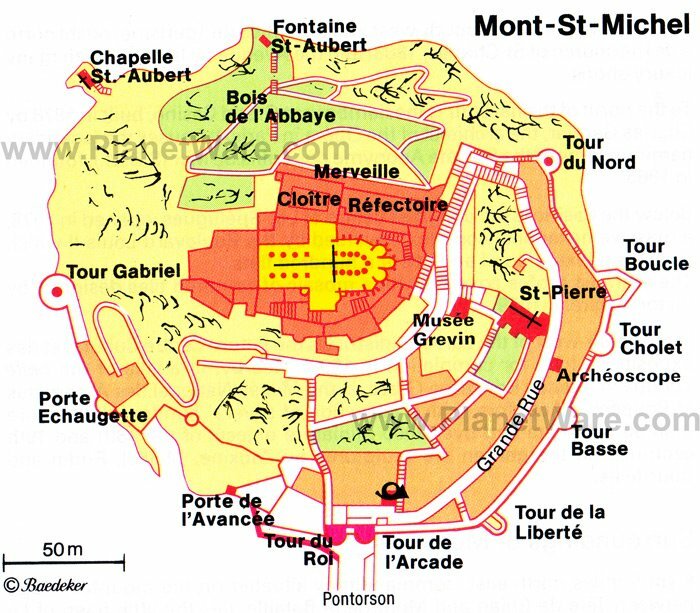 Accessibility: The Abbey of Mont Saint-Michel is not accessible to visitors with impaired mobility. There is a 200-meter pedestrian path to the top of the mount and then a staircase of 350 steps. Attend a Concert: The abbey hosts an annual music festival between June and September, with mostly classical concerts in exquisite venues within the abbey that include the Salle des Chevaliers (Knight's Hall), the Eglise Saint-Michel, and the Chapelle Notre-Dame-sous-Terre. The schedule is on the abbey website. Getting to Mont Saint-Michel: Parking is on the mainland 2.5 kilometers from Mont Saint-Michel. From the parking lot, a shuttle bus drops visitors off 400 meters from the entrance gates. If planning to arrive by foot, first inquire about the tides. It is important to pay close attention to the tide schedule as it is extremely dangerous to venture into the bay when the water is rising. During spring tide days, visitors must cross two hours before the tides. Also note that walking across the bay is best done in bare feet.